The Senate is working on energy legislation—but Senators Roy Blunt (R-MO) and Shelley Moore Capito (R-WV) have introduced an amendment to that bill that would overturn the President's landmark Clean Power Plan. For the first time in American history, we have a national plan to limit the dangerous carbon pollution spewing from our fossil fuel-fired power plants. We can't let that slip away. 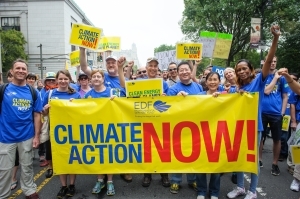 Take action: Tell the Senate to reject this assault on climate action. I'm writing today to ask you to stand against the amendment Sens. Blunt and Capito introduced on the Senate's energy bill. This amendment withdraws the Clean Power Plan, a critical action America is taking to finally reduce carbon dioxide emissions from our power sector. This effort is short-sighted and backward, and I urge you to reject this attack. I strongly support EPA's efforts to limit industrial carbon pollution from existing power plants, the largest source of pollution in our country. Carbon pollution leads to more asthma attacks for children, drought for farmers, and the devastating effects of extreme weather events. EPA's Clean Power Plan will protect public health, fight climate change, and help our economy by sparking innovation in clean energy technologies. Please stand against this and any other attacks on climate action. Our families and communities are counting on your leadership.